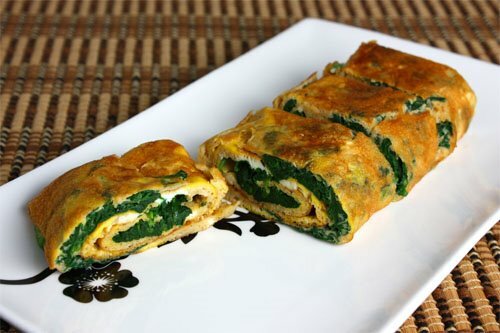 Omelettes have been my all time favourite, as a breakfast meal or a snack. The first thing that I learnt how to cook at the age of twelve was actually an omelette. And now that I have gotten into food as a full time passion / profession and as a self proclaimed culinary historian,food anthropologist (without an anthropology degree of course-just an interest whch I inherited from my late father who was an anthropologist by profession and my guiding light to culture and tradition), I keep wondering what could be the origin of the omelette-who made the first omelette, when and how. Today, while I was stuffing my omelette with smoked chicken and cheese, I thought why not do a little more research on its etymology and anthropology? Here I am scribbling yet another story of a dish that tells us one golden rule of cooking-INNOVATE. The Romans are giving me ideas. The next omelette I cook shall be savoured with a tinge of honey in it, of course! But trying to do as Romans do even before reaching Rome? May be I’d start with what we find on Indian streets. A boy, you’re not sure has crossed fourteen years of age, tries to beat two eggs in a steel glass with a spoon. He adds chopped onions and green chillies into it. A pinch of salt and he beats it further. Now, he adds a lump…a huge lump of butter into the steamy frying pan. He keeps beating the eggs while the volatile butter evaporates and melts simultaneously. Then he splashes the beaten eggs into the frying pan. Within minutes we have what we call the desi omelette. Such is a common scene everywhere on the streets in India, be it a big city, a small town or even a village for that matter. In the remote Kargil in Jammu and Kashmir and so much so in Tawang in Arunachal Pradesh I remember one evening food I did not get, but omelettes I surely got-such is the vastness and expanse of the omellete. 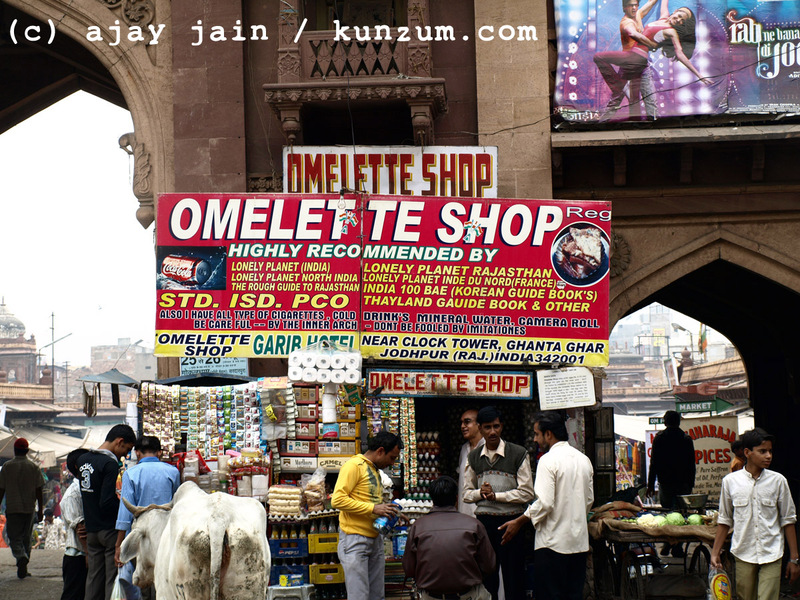 I remember the legendary, the world famous… Omelette Man of Jodhpur. He may not be a household name in the west or the east, but he sure has found his way to be featured in every travel guide book right from the US to France, Japan to Germany. Piere-a frend of mine from France fell in love with Omelette Man’s omlettes. His testimony speaks a lot because he is an ardent omelette lover. 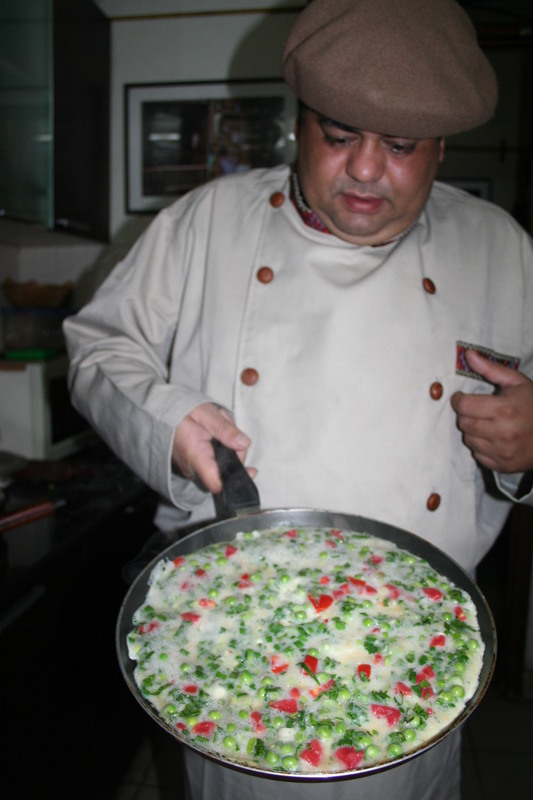 Ramkishan Gawlani, the Omelette Man is one tough old cookie. 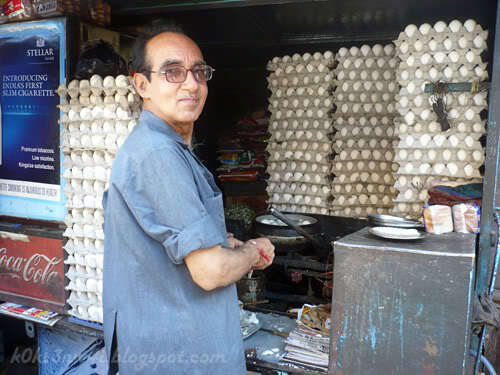 He has set up a huge signboard boasting his authenticity to the world, “The Omelette Shop – recommended by Lonely Planet,” I for sure loved his omlettes especially his masala and cheese omellete. It had pleasantly surprised me when he actually dirverted from desi flavour of the omellete to western tastes. His shop consumes over a thousand eggs a day. It is a pity that he has more global fame than national fame. There are hundreds of stories woven around the omelettes in India. I remember in Munnar in Kerala many moons back, I came across Jose Mathews a post graduate in history who had opened a chai, coffee and omellete shop. Boy, he had a tale to tell as to how he was an ex-naxalite-came back to the main stream-he had no job despite his qualifications -decided to set up something to sustain himself and did what he loved best-he loved omelettes and was good at making them so he opened a chai shop serving omelettes which were a hit with many tea planters(Munnar being tea country), tourists and the locals. I learn today from a planter friend of mine from Munnar that he is running a successful Malabar resturant in Cochin. Inspirational-is it not? I could go on and on with personal ancedotes revolving around omellete but I feel we should now concentrate on the basics both historical and gastronomical. The Chicken and Egg Question: Human beings have been consuming eggs since the neolithic ages. Not only were they easy to procure, they were excellent protein sources. Okay, for the prehistoric man it relieved him of hunger and energised him fast enough. Ostrich and chicken eggs were most common. After the introduction of cooking, egg became easy to cook and moulded into several dishes. It was diverse and offered a different taste each time it was cooked even with a slight difference in recipe. With induction of religion in sociological map of the world, some religions found it symbolic vis-a-vis life and hence encouraged eating and decorating eggs. However, some others considered it un pious. Okay, I realise that this paragraph still doesn’t answer what came first : chicken or egg. It only says what was eaten first! Phew! 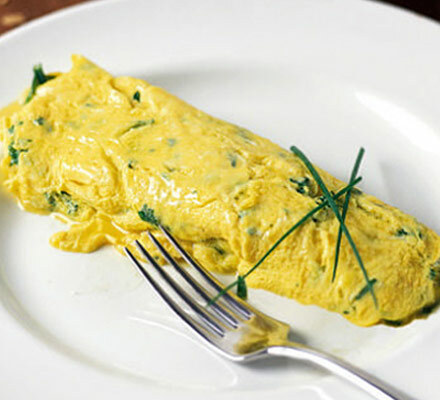 The recipe of omelette is as basic as it can get. Beat the eggs. Condments follow. The French however, are not so simplistic. They deal with their food wth technique. Though it may be long to read, have to mention at this point in time an excerpt from an article ‘Physiology of Taste’ or Physiologie du Gout, written by French lawyer, thinker and gastronome Jean Anthelme Brillat-Savarin in 1826. I think it is simply brilliant. …The conversation passed from subject to subject, but I, as a philosopher, thought the secret of the preparation of such a dish must be valuable. I ordered my cook to obtain the recipe in its most minute details. I publish it the more willingly now, because I never saw it in any book. Put in also a fresh tunny about as large as an egg, to which you must add a charlotte minced. Mix the tunny and the roes together, and put the whole in a kettle with a portion of good butter, and keep it on the fire until the butter has melted. This is the peculiarity of the omelette. Take then another piece of butter and mix it with parsely and sage. Put it in the dish intended to receive the omelette, cover it with lemon juice and put it on hot coals. Then beat twelve eggs, (fresh as possible), pour in the fish and roe so that all may be perfectly mixed. Then cook the omelette as usual, making it thin and firm. Serve it up hot. This dish should be reserved for breakfasts, where all the guests are connoisseurs. It is caviare to the vulgar. 1. The roes and fish should be warmed, not boiled. They will thus mingle more easily with the eggs. 2. The plate should be deep. 3. It should be warm, for a cold porcelain plate would extract the caloric of the omelette and make it insipid. In the eastern part of the world, i.e. 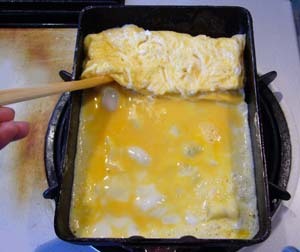 Japan, omelettes are called Tamagoyaki. They make several leafy omelettes, roll each of them inside the other and create a big omelette. Well, that was just for information! Anyways, whatever people did centuries ago is only in the pages of history. My reality is that, omelette is the daily affair. It is very unlikely that there comes a day when I do not prepare one. For me, the most satiating part is to observe the contentment and sheer delight on the faces of people who relish the food I prepare. More so, when they demand something to be prepared. When someone can shun their inhibition to ask for their favourite dish to be prepared, one can judge the intimacy of a relationship. It is like asking your mother to give something to eat. And likewise. For me an omelette is like a canvas. The base is plain and it is upon the artiste to add colour. Some artists rely on their technique, rest on their instinct. Some of course on their ‘secret ingredient’. I am thankfully liberal in certain matters, especially matters like these. Some of my friends love the omelette I stuff with seekh kebabs. Others prefer the chicken, mushroom and cheese recipe. Like the father says in Kung Fu Panda…there IS no ‘secret ingredient’. All I am driven by is love and love alone.